We had planned an early breakfast followed immediately by an early forest walk but the weather changed our plans somewhat. It rained heavily at 4am but had eased off by 6am at breakfast but persisted until 7am when we finally made a move. It was dull and overcast and even darker in the forest hence our bird list for that first hour was small, in fact we walked nearly 2km and only saw a Great Jacamar and a Plain-winged Antwren, then we found this very showy Marail Guan, it was high up but was easy to see. The track led us out to the main road which had wide cleared-margins and gave us a good expanse of forest ‘edge’ to scan. 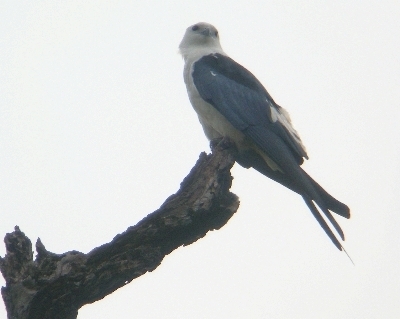 Swallow-tail Kites numbered up to 12 and some perched high on dead branches giving excellent views, as did Crane Hawk and Plumbeous Kite. Black-headed Parrots were a nice find as was a Black Nunbird, these sightings were enjoyed by the group along with 2 or 3 species of both Macaws and Toucans. 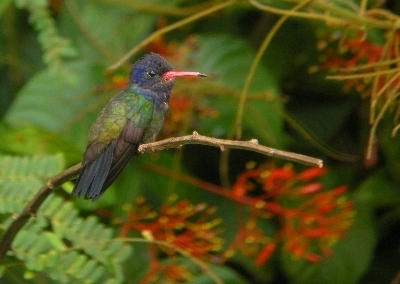 But the majority of our time was spent looking at ‘hummers’, it was great to look down on the bushes from our vantage point on the raised track, we found several new species for our list; Blue-tailed Emerald, White-chinned Sapphire, Grey-breasted Sabrewing and one lucky person watched a Racket-tailed Coquette. We hadn’t moved very far and still the birds came thick and fast; Blackish Nightjar showed extremely well a Dusky Parrot posed for us too, we added Turquoise Tanager and Coraya Wren before returning to the lodge for dinner. 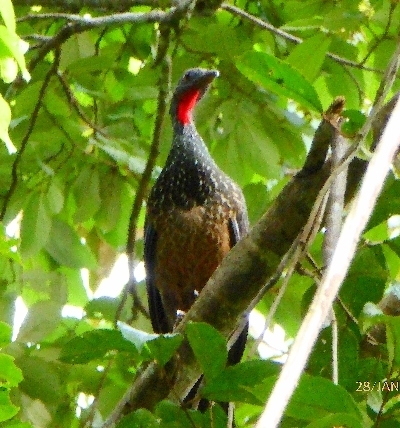 On the way back we found Spix’s Guan and a couple of the group managed to find a Guianan Red Cotinga. We had the usual long lunch and met up again at 3pm for another walk, we took the same forest track down to the main road but this time, in brighter conditions, we saw a lot more. Black Carrasow, Marial Guan, Red-throated Caracara, Wedge-billed Woodcreeper, White-sided Antbird, Golden-headed Manikin and several more. At the road we turned to a different direction and birded along the forest edges, it wasn’t very good, not too many species were showing except the usual macaws, toucans, aracaris and tanagers. So we walked back to the Lodge ans got ready for dinner.